Public support for a strong global deal on climate change has declined, according to a poll carried out in 20 countries. Only four now have majorities in favour of their governments setting ambitious targets at a global conference in Paris. In a similar poll before the Copenhagen meeting in 2009, eight countries had majorities favouring tough action. The poll has been provided to the BBC by research group GlobeScan. Just under half of all those surveyed viewed climate change as a "very serious" problem this year, compared with 63% in 2009. The findings will make sober reading for global political leaders, who will gather in Paris next week for the start of the United Nations climate conference, known as COP21. It's being billed as the best opportunity in six years to achieve a significant advance on tackling rising temperatures. In 2009, in Copenhagen, the leaders failed to deliver a strong outcome despite widespread public expectation that a deal was needed. Around 1,000 people in each of 20 countries were questioned about their attitudes. The survey was carried out in January and February of 2015. The number rating climate change as a very serious issue in richer countries declined significantly from 2009, while support for strong action at the Paris conference has only grown in three of the 20 countries polled. Canada, France, Spain and the UK are the only four with majorities in favour of their governments taking a leading role. All told an average of 42% of those polled want their government to play a leadership role in setting ambitious targets, while another 41% want their government to take a more moderate approach and support only gradual action. "The public are less concerned about climate change, and when you put that in the context of the climate conference in Paris, the findings show less support for an ambitious and binding agreement at a global level than there was ahead of COP15 in 2009 in Copenhagen," said Lionel Bellier, from GlobeScan. "It's not an abrupt change of views, the trend seems to be now towards a softer approach." Public support has also declined in developing countries including China and Indonesia. The pollsters believe that global economic recession has played a significant role in changing people's perspectives on rising temperatures. "When we look at the broad range of environmental issues, they all have gone down in terms of concern, in all countries, since 2009, at the same time you see that concerns about the economy have risen, and what's capturing the agenda is terrorism, which has risen up the agenda over the last two years." Commenting on the findings, former UN Executive Secretary, Yvo de Boer, now with the Global Green Growth Institute, said he wasn't surprised there had been some fall-off in support since 2009 when he chaired the meeting in the Danish capital. "It is certainly true that in the run-up to Copenhagen there was very broad international support and enthusiasm to see a strong outcome," he told BBC News. "There was obviously very significant disappointment when that didn't happen and on top of that came the financial crisis, so I do think there is a pre-occupation with more direct economic concerns of today." What may also cause concern for political leaders meeting in Paris is the growing sense among rich and poor countries that taking action on climate change could be costly and might destabilise fragile growth. "The slowdown of the economy in China in the past 12 months has certainly impacted people's views, but also people are increasingly worried about the impact on their economies of curbing emissions, if we take major steps on climate change," said Lionel Bellier. The pollsters suggest that citizens globally are becoming more informed about climate change. They also found more than twice as many people today blame rising levels of carbon dioxide from human activities for extreme weather events as compared to a similar poll carried out in January 2000. 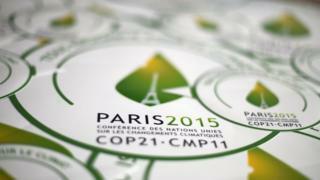 COP21 - the 21st session of the Conference of the Parties - will see more than 190 nations gather in Paris to discuss a possible new global agreement on climate change, aimed at reducing greenhouse gas emissions to avoid the threat of dangerous warming due to human activities.